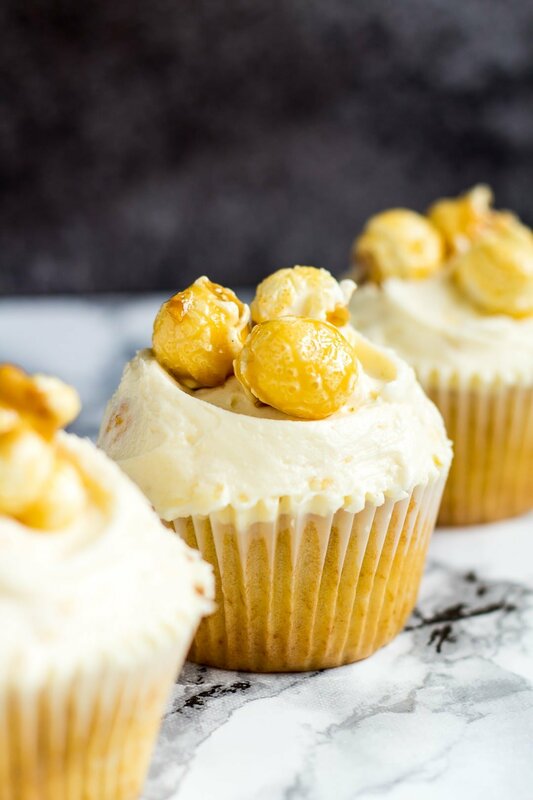 Toffee Popcorn Cupcakes – Deliciously moist and fluffy vanilla cupcakes stuffed full of toffee popcorn, and topped with a creamy buttercream frosting with popcorn bits! 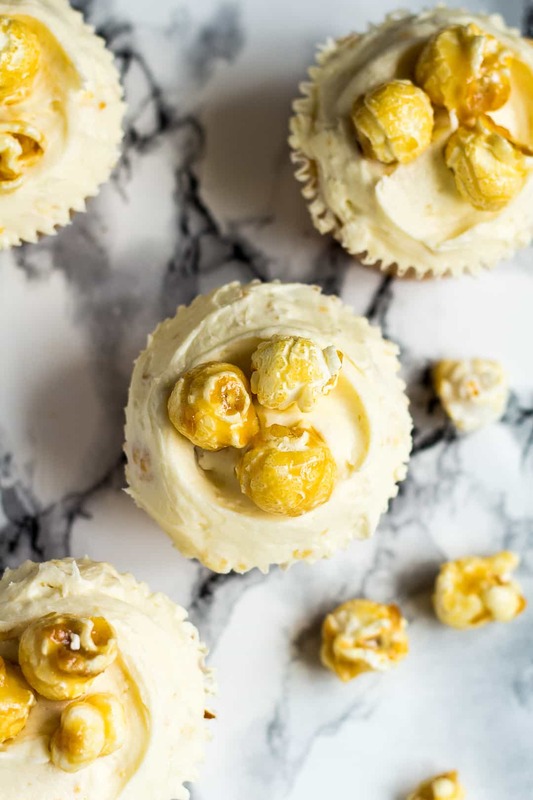 These Toffee Popcorn Cupcakes are just so fun to make, and even more fun to eat. Why not change things up, and serve these on movie night? 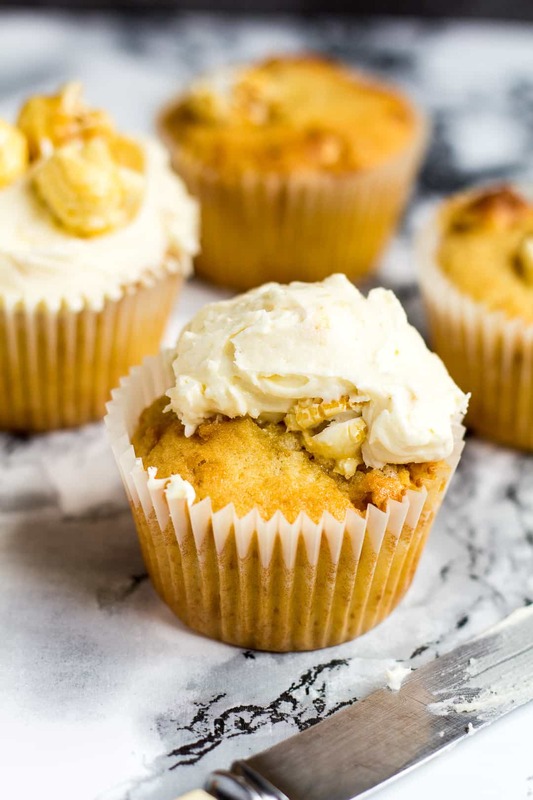 To make these cupcakes, simply whisk together the flour, baking powder, baking soda, and salt. Set aside. Whisk together the eggs and sugar until combined. Add the vanilla extract, butter, and yogurt, and whisk until combined. Fold in the dry ingredients, then fold in the toffee popcorn. Divide the batter evenly between a muffin pan lined with muffin cases, filling them only 2/3 full. Place a few extra popcorn pieces on top, if desired. Bake for 15 – 20 minutes, or until a toothpick inserted into the centre comes out clean. Allow to cool for 5 minutes in the pan, before transferring them to a wire rack to cool completely before frosting. For the frosting, beat the butter until pale and creamy. Add half of the icing sugar and beat until smooth and combined. Repeat with the remaining icing sugar. Add the milk, and beat until light, fluffy, and spreadable. Mix in the crushed popcorn until evenly incorporated. Pipe or spread the frosting onto the cooled cupcakes, then top each cupcake with toffee popcorn. Try these delicious cupcakes next! 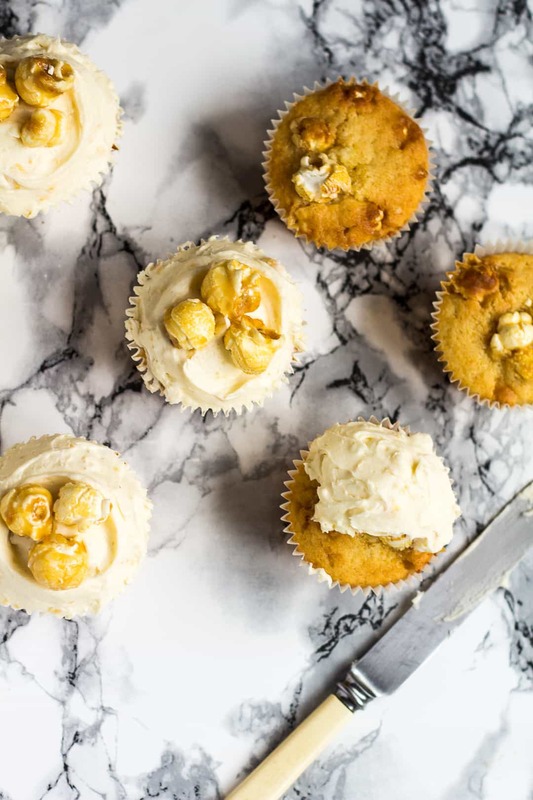 Deliciously moist and fluffy vanilla cupcakes stuffed full of toffee popcorn, and topped with a creamy buttercream frosting with popcorn bits! Preheat the oven to 180C/350F/Gas 4. Line a 12-cup muffin tin with muffin cases, and set aside. Whisk together the eggs. Add the sugar, and whisk until combined. Add the vanilla extract, butter, and yogurt, and whisk until combined. Fold in the dry ingredients, then fold in the popcorn. Divide the batter evenly between the muffin cases, filling only 2/3 full. Place a few extra popcorn pieces on top, if desired. Bake for 15 - 20 minutes, or until a toothpick inserted into the centre comes out clean. Allow to cool for 5 minutes in the pan, before transferring them to a wire rack to cool completely before frosting. Using a handheld or stand mixer fitted with the paddle attachment, beat the butter on high until pale and creamy. Add half of the icing sugar and, starting on low speed and working up to high, beat until smooth and combined. Repeat with the remaining icing sugar. Add the milk, and beat on high until light and fluffy. Add more milk if too thick, or more icing sugar if too thin. On low speed, mix in the crushed popcorn until evenly incorporated. Pipe or spread the frosting onto the cooled cupcakes. 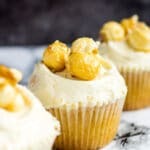 Top each cupcake with toffee popcorn, and enjoy! *Make your own cake flour! Measure out 1 and 1/2 cups (190g) of plain/all-purpose flour, remove 3 tablespoons, and replace with 3 tablespoons of cornflour/cornstarch. Sift well. Leftover cupcakes can be stored, in an airtight container, in the fridge for up to 3 days. Oh my… Aren’t these cute! Perfect for kids party if you ask me. Yum! Thanks for the recipe..they look delicious.